UPDATED: Mon., Dec. 18, 2017, 6:04 p.m.
Rep. Cathy McMorris Rodgers is making the final push for a Republican-backed tax reform proposal slated for Congressional approval this week that would eliminate the penalty for failing to attain health insurance. The measure dropping the requirement that taxpayers obtain a health insurance plan, one of the provisions of the Affordable Care Act intended to ensure healthy people bought insurance, is one of several changes to the proposal Republicans in the House passed late last month. Both chambers are expected to vote on the final version of the tax bill this week, and the congresswoman has a telephone town hall planned Tuesday night at 6 p.m. to discuss the details with constituents. The proposal, which temporarily cuts taxes for individuals while also permanently reducing the corporate tax rate from 35 percent to 21 percent, remains unpopular with Democrats. Lisa Brown, McMorris Rodgers’ Democratic challenger in next year’s race for the seat representing Eastern Washington, said the bill doesn’t do enough for families and small businesses. “I have to say, there are not credible economists who believe that this will not create a huge amount of debt,” Brown said. McMorris Rodgers pushed back on the conclusion of the nonpartisan Joint Committee on Taxation that the tax bill would increase the federal budget deficit by $1.5 trillion over the next decade. The congresswoman said she believed that the economic growth projected by the committee and most economists and bankers, including those at the Wall Street firm Goldman Sachs, around 2 percent was too conservative and would be accelerated by lower tax rates. McMorris Rodgers also dismissed claims made by Democrats, including Washington Gov. Jay Inslee, that a tax plan cutting revenue was an attempt to force a discussion on reform of entitlement programs, such as Medicare and Medicaid. House Speaker Rep. Paul Ryan, R-Wisconsin, has hinted that changes to these programs could be the next legislative priority for Congressional Republicans. 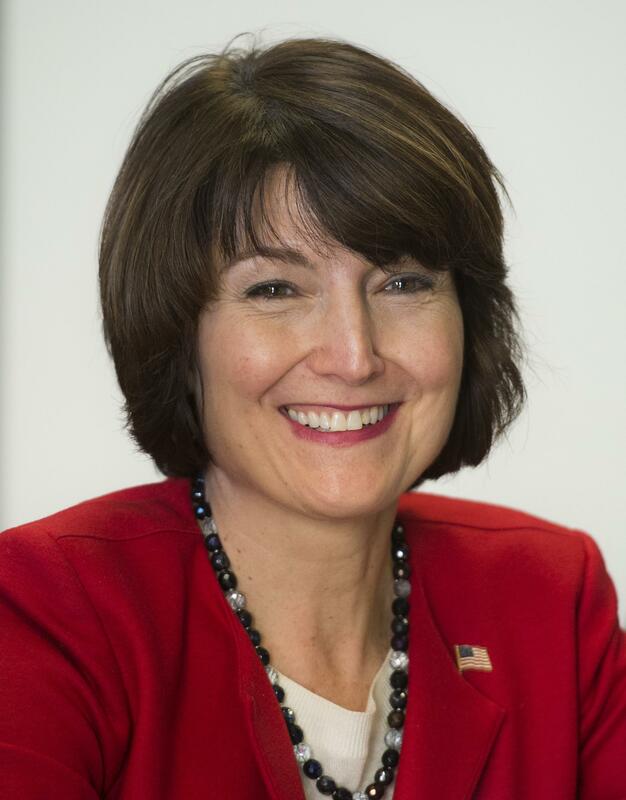 McMorris Rodgers said there’s some interest in Republican circles to tackle both reform to certain social programs and President Donald Trump’s campaign pledge to repair the nation’s aging bridges, rail lines and highways in the form of workforce training. Brown pointed to Ryan’s comments, and those of Senate Majority Leader Mitch McConnell, indicating changes to social spending programs appeared on the horizon. Brown has planned a forum of her own in the district to discuss the tax plan, and other major federal legislative issues. The meeting is scheduled for Wednesday, from 6 p.m. to 7:30 p.m., at the Spokane Valley Library, 12004 E. Main Ave. While the Republican tax proposal doesn’t touch funding for programs that include Medicare and Medicaid, a federal law requiring new spending to be offset by increasing revenue or cutting expenses will apply to the plan if it passes. If that doesn’t happen, the Office of Budget Management is authorized to order automatic spending cuts within 15 days of Congress adjourning. The nonpartisan Congressional Budget Office, reviewing how that law would affect funding levels for different programs should the tax reforms become law, estimated Medicare funding would be reduced by $25 billion in automatic spending cuts next year if Congress doesn’t act. McMorris Rodgers pointed out that lawmakers have the authority to exempt legislation from the deficit reporting requirement and stop the cuts, though that also means the country’s projected deficit continues to climb. That has happened 29 times since the spending law passed in 2010, including a $6.3 billion legislative package last year that concentrated funds to combat opioid addiction and aid cancer research. “There is no intention for it to be impacting Medicare and Medicaid,” she said. The AARP, the nation’s largest lobbying group for aging Americans, issued a letter earlier this month urging Congress to exempt the tax bill from the deficit-neutral requirement. The tax plan includes two of McMorris Rodgers’ proposals to expand tax-free savings accounts for young people with disabilities. The measures increase the amount that can be placed annually in the account before taxes kick in and transfer money that had been saved in a college fund account to an account that will cover medical expenses, tax-free. The final negotiated version also re-institutes a financing method popular among developers of affordable housing and does away with the provision that would have taxed graduate students for the amount of tuition waived by their school. McMorris Rodgers said she supported both of those changes, despite voting in favor of the original House tax bill that did away with them. The legislative package is expected to pass without Democratic support. Democratic Sen. Patty Murray, who served on the committee reconciling the House and Senate tax bills, called the proposal “a massive giveaway to the wealthiest Americans and biggest corporations” in a statement last week. If passed, the bill would be the first major effort to reform the country’s tax system since 1986, when Republican President Ronald Reagan signed a proposal that was largely endorsed by his political rivals. Rep. Tom Foley, D-Spokane, and Sens. John Kerry, Ted Kennedy, Joe Biden and Al Gore all voted in favor of the legislation, which reduced the number of tax brackets from 15 to four. That bill also increased the standard deduction, as does the current proposal, which doubles the standard deduction filers can claim. McMorris Rodgers said she wasn’t concerned about the lack of Democratic support for the proposal, which passed both chambers of Congress on strict party-line votes. “I think it has served the American people well to work through this process the way that we did,” she said. Published: Dec. 18, 2017, 5:49 p.m. Updated: Dec. 18, 2017, 6:04 p.m.